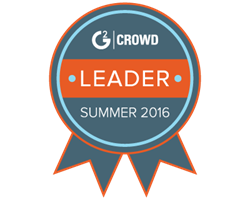 DiscoverOrg (http://www.discoverorg.com), a provider of business intelligence solutions that power growth for sales, marketing,and staffing teams, was named a leader by G2 Crowd, the world’s leading business software review platform, in their Summer 2016 Sales Intelligence Software Grid report. Industry wide dissatisfaction of data accuracy -- one of DiscoverOrg’s key differentiators with a 95% accuracy guarantee and 100% human-verified data. Customer appreciation for CRM integrations -- DiscoverOrg has a multitude of not only CRM integrations (of which there are 7; including Salesforce®, SugarCRM, Netsuite, Microsoft Dynamics™, Talent Rover, and the recent additions of BullHorn® & ZoHo) but also Marketing Automation integrations (such as Marketo®, Eloqua, and Hubspot™), a Google Chrome™ extension, and the new branch of Sales Development Representative (SDR) focused integrations (including SalesLoft & Outreach). Mixed feelings on crowdsourced data -- DiscoverOrg used human-verified data, with every record refreshed at a minimum of 90 days. For more information about DiscoverOrg, please visit http://www.discoverorg.com. DiscoverOrg is the leading sales and marketing intelligence tool used by the top technology vendors, staffing companies and consultants targeting IT, Finance, Marketing, Engineering, Technology and Product Development departments of Fortune-­ranked, Mid­Market and SMB companies in North America and Europe. Offered in the form of a constantly refreshed database, DiscoverOrg specializes in mapping out the org charts, including verified email addresses, direct-dial phone numbers, reporting structure, new projects & initiatives and technology installed base. Each of the decision makers in the DiscoverOrg database are updated and refreshed by the company’s team of in-house researchers at least once every 90 days, enabling customers to reach the right person at the right company with the right message. For more information, please visit http://www.discoverorg.com.